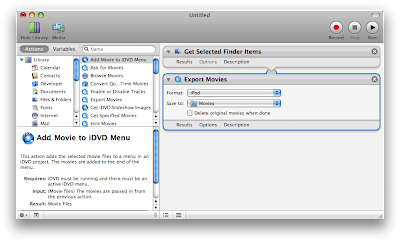 A New Mac Tip Every Day: Convert videos to iPod/Apple TV with Automator! If you often convert videos to the iPod or Apple TV format, you can use Automator instead of constantly having to load QuickTime Pro and selecting the right format. There is a QuickTime action in Automator for the iPod and Apple TV presets. You can then export the script to the Finder or to the script menu to easily access it.